Before we get started, let’s quickly cover a few recommendations for new knitters. It is the recommendation of this author that a beginner to knitting choose needles that do not slide all over the place. 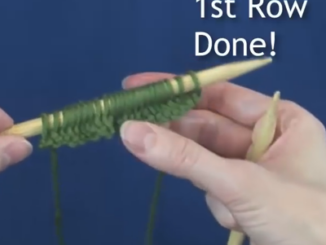 I recommend purchasing a pair of bamboo needles (as shown in the video tutorials below) because they "grip" the yarn far better than metal needles. Or, you can purchase a pair of plastic needles and "rough them up" with a fine grain sand paper. Of course, you can still use metal needles, but just be aware that they may be a little bit slippery. We’ve tested a range of needles, and in our opinion, the more expensive ones do not knit any differently than the cheaper ones (keeping in mind the slippery factor.) It is still up to the person doing the knitting and their technique. That being said, if using a $40 (US) pair of needles makes you feel good about what you are doing, then go for it! You can still get great results with needles that cost less than $10. * Felting: A process where material (often wool) is knitted and then washed in hot water to induce matting and shrinkage of the fiber. This creates "felt" and is prized for its dense and durable qualities. If you are left handed, you might prefer to reverse the hands if you find that the "right hand" instructions below are too difficult. That is, where knit with the right hand needle below, you would instead use the left one. First, you’re going to start with a slip knot. Do not cut your end piece short. Make sure you leave enough slack after the knot so that you can cast on more stitches. The loop should be connected to the yarn ball. Cast on the first row by slipping the end piece around your left thumb. Slide it onto the knitting needle. Loop the yarn from the yarn ball around the needle with your right hand, and loop the left hand’s loop over the right hand’s loop to complete the stitch. Continue casting on as many stitches as you need for your project. When you complete casting on your first stitches, take the needle with the cast-on stitches in your left hand and the empty needle into your right. You will slide the empty (right) needle into the first loop on the left, from the bottom moving up through the loop, positioning the empty (right) needle behind the left needle. Loop yarn from the yarn ball around the right needle from back to front, passing it between the two needles. Keep the loose yarn to the back. Slide the right needle down through the left needle’s loop and slide that loop off of the left needle. This will create a new loop on the right needle. Repeat this for each loop on the left needle, creating new loops on the right needle. This will create the first row. Once you complete the first row, you will then transfer the right needle, which is now full of stitches, to the left hand, and the left needle, which is now empty, to the right hand to begin the process all over again. Repeat the above instructions for this row. Using the knit stitch on all of these rows creates what is called the Garter Stitch. 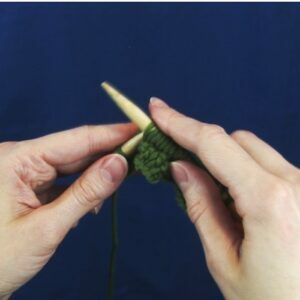 To purl, you will push the tip of your right needle through the top loop on the left, keeping the right needle in front of the left needle as you pass it through the loop. 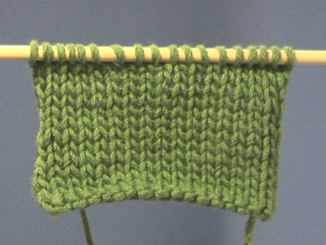 In the garter stitch, you are pushing the right needle behind the left needle. Again, to purl, you will push the needle in front of the left needle through the loop. Keep the yarn in the front. Loop the yarn from around the tip of the right needle, front to back. Repeat this step for the rest of the row. You can form many different stitch variations and designs simply by combining these two basic stitches together in various ways. Knitting a row of garter stitches, then purl a row, then a row of garter stitches, then purl a row (and repeating this) is called the stockinette stitch. Rib knit is created by a combination of knit, purl, knit, purl in the same row. For example, Knit 3, Purl 3, Knit 3, Purl 3. When you go to form the second row, you would reverse this process: Purl 3, Knit 3, Purl 3, Knit 3. On the third row, you would repeat the first step: Knit 3, Purl 3, Knit 3, Purl 3. There’s countless combinations with knit/purl stitches. You can knit 2, purl 5, knit 2 and when you flip to the next row, purl 2, knit 5, purl 2 – this will give a striped effect. You can also alternate these patterns to create a checkerboard design. At some point, assuming you’re working on larger projects, you’re going to run out of yarn. You’re going to want to add another skein of yarn so you can keep going. You can do this by simply tying a square knot with the two ends, and then weave the ends in. This concludes The Basics Of Knitting.